I was in Ann Arbor, Michigan for a hot minute this past weekend, and pretty much went directly from the Detroit airport to the Jewish deli-turned foodie phenom, Zingerman's for my standard #36 on sourdough with a new pickle (basically a veggie reuben with coleslaw instead of sauerkraut). 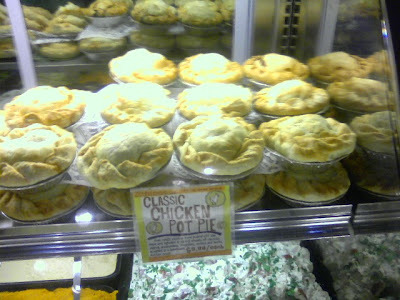 I found not only the promise of one of my favorite lunches, but an array of pot pies available there during the months of January and February. It's a good thing they were out of their vegetarian pie option, or I would have had quite a time deciding between "Lila & Izzie's Skokie Skidoo" sandwich and the "Fungi Pot Pie." 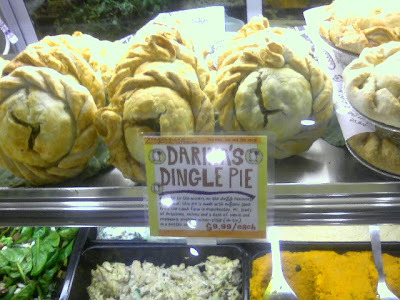 I was intrigued by this "Daria's Dingle Pie," which they purport to be "a salute to the miners on the Dingle Peninsula of Ireland," and is apparently a standard Irish savory pie recipe, traditionally sold at Lammas Fairs during the last week of August. 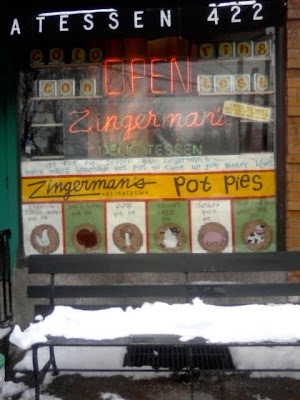 This tribute to the miner in pie form, though, made me wonder why Zingerman's wasn't offering a pasty-- the Cornish savory pie that was frequently consumed and popularized by Finnish miners in Michigan's Upper Penninsula. Perhaps they'll cover that later in some future 'Traditional foods of Michigan' or 'Traditional foods of the Midwest' or 'Traditional foods mistaken for stripper-garb' display. they just started making pasties at the Bakehouse!